From there it was a short hop, skip and jump to River City Yarns' south store -- a lovely place for a yarn-fondling break. 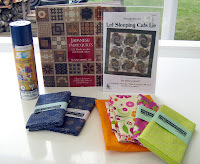 I managed to leave without a purchase, but with a wonderful idea for yet another gift -- possibly even for Christmas! Leaving RCY, I headed west and north to my final Shop Hop destination -- Earthly Goods. I was armed and ready -- because much to my delight, my DD gave me a $25 gift card to EG on Friday night at dinner! Part of my birthday celebration! Man-o-man was it tough to figure out what I wanted. 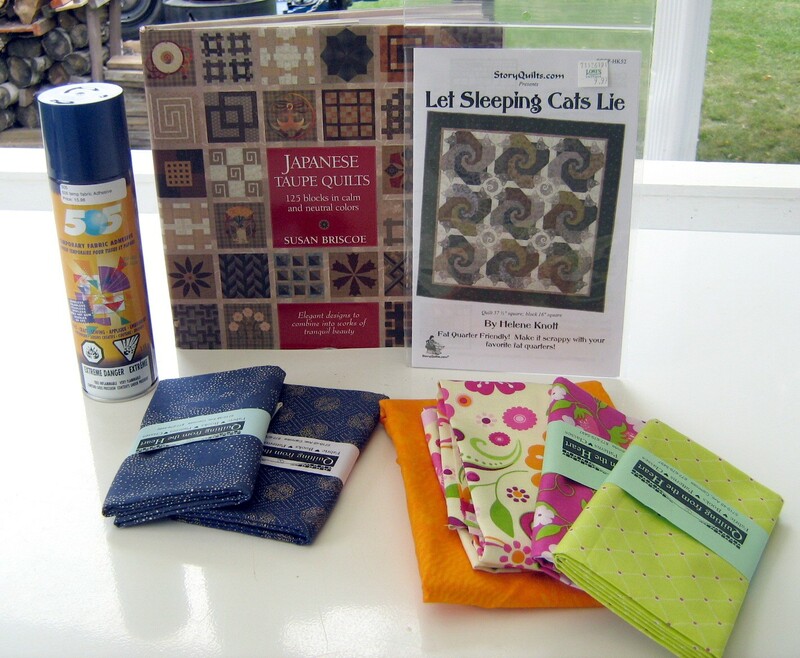 I finally decided on a beautiful book that I'd seen at the Sylvan Lake Quilt Show in June -- Japanese Taupe Quilts, by Susan Briscoe. Oh-h-h-h-h! I have a few ideas for the blocks illustrated, and will undoubtedly be putting this text to use in the coming year. It's being my final stop, I entered one more door prize draw, and made one more Food Bank donation (for another draw). I haven't heard anything -- no messages on the phone when I got home -- but perhaps the drawings will take place tomorrow. One can only hope! The Big Draw over all is for $1,000 in gift cards from the shops! Whoa! My greatest surprise of the day, though, came on my way back to my daughter's for dinner. There's a wee yarn shop in her neck of the woods called "Wool Revival". Alas, it's been closed much of the past couple of years. Bonnie, the owner, was ill, and it has taken her months to recover. The good great news is that she has, and she's back almost full time -- and I found her in fine form, hovering over a delicious button box with another gal, trying to find appropriate buttons for a colour-work pillow cover they were test-knitting for a local designer. I was over the moon to see her, and we spent a good hour just catching up. Then I succumbed to temptation and bought a skein of gorgeous sock yarn from a local producer, NC Farms, Nevis, Alberta. The only other place they sell is at the Red Deer Farmers' Market, which is on Saturday mornings, and to which I never seem to be able to get! 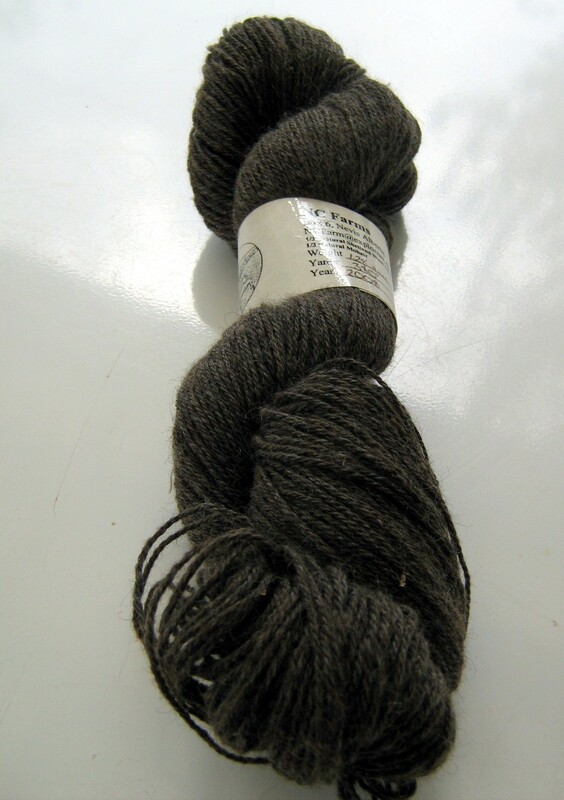 The yarn is lovely -- a natural deep brown with a hint of green. Bonnie told me the mohair was added for longer wearing socks, and the alpaca will make 'em many times warmer than straight wool. The yarn is soft, too...I'm thinkin' perfect for a lace and/or cable pair to wear on winter walks. This morning dawned breezy and cool. I accompanied my daughter to church and then, after a light lunch, bid her adieu to be on my way home. Once here, I spent some time in the garden propping up tomato plants, picking a ripe one or two, clearing out lettuce and slicing and freezing more of the apples I picked a week ago. It's time for bed. Time to bask in the delightful memories of the weekend, the blessing of family, recovered friends, and the fun to be found in the colour and texture of fabric and yarn -- and time to be truly thankful. Margaret, you sound refreshed in body and soul! Loved reading your adventure. What a wonderful trip! There is nothing so sweet as celebrating a birthday with loved ones. that sock yarn sounds delicious!